When it comes to shopping for my kids, thank goodness for the wonderful world of the Internet. There are a dizzying variety of colors, hipster styles, Euro shapes and eyeball-searing prints to choose from. But it’s overwhelming. And personally, I long for the simpler styles of the 80s. That’s, of course, about the time I was buying my own backpack as I entered high school. I already owned one — a nylon Eastpak that my mother bought for me at the Jewelcor showroom. It was fine for junior high, but it didn’t have the cool factor a freshman truly required. Back then, there was really only one place to find the “must-have” backpack: the L.L. 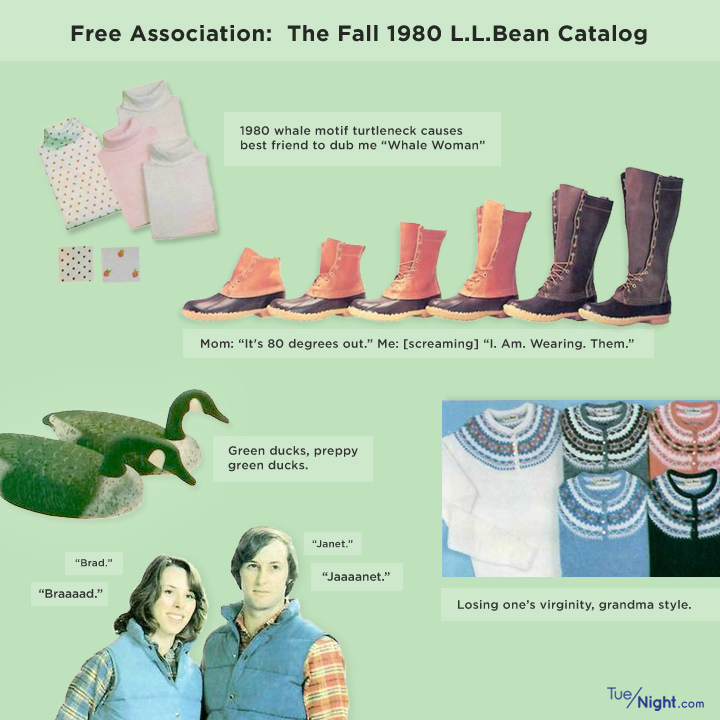 Bean catalogue. But this required some work. It’s hard to remember a time when catalogues did not fill our mailboxes unbidden, but back then, you had to request to be on the mailing list, and our family was not. I think I must have cribbed the L.L. Bean address or phone number from The Official Preppy Handbook and ordered a catalogue myself. Finally, it arrived, in all its watercolor and badly airbrushed-photo glory. Thumbing through the pages, there were only a few choices: rucksacks, some serious hiking satchels and then the classic style I coveted. It may have come in a mini size and a regular size. But there were no expandable gusset versions, no fancy packs on wheels, no styles with coordinating lunch bags. It was just a backpack: plain, simple, serviceable — and pretty well perfect. I labored over which color to choose for days. The royal blue looked sporty but perhaps a little too New Wave-y. The red was elegant and deep, but — gasp! —might clash with my red hair. The forest green was lush, but could also be perceived as too rustic. However that’s the shade I finally settled on, after years of hearing that it was the most flattering color on me. I filled out the order form by hand, carefully checking the product number and color, and the chart to see how much tax and postage would cost. I gave my mother my saved-up cash so she could write a check. I found a stamp to mail the form, kissed it good-bye, and prepared to wait the 4-6 weeks for processing and delivery. Weeks later, when it finally arrived, I transferred my belongings from the cast-aside Eastpak and, as the cliché goes, never looked back. I loved that backpack more for all the days I anticipated it. It lasted me through high school, festooned with various phases of rock album buttons (Rio! Reach the Beach! Blues for Allah!). It was the perfect canvas for a teenage girl’s ever-changing moods. We tend to spend as much time making decisions these days, thanks to the Internet, as it took me to obtain the L.L. Bean catalog and fill out the order form. But the time just doesn’t feel as well spent. Each fall I spend hours looking for the perfect pair of black boots, and still come away with the nagging sense that I didn’t get the best ones out there. I’m never really content — there are just too many options that may scratch a particular itch. On the other hand, one-click buying and overnight shipping speed up the time that the long decision process slowed down, and I’m glad my kids can find something that they love and feel is perfectly made for them. Still, when we shop for backpacks this year, I may limit the kids’ choices to a few sites. By narrowing their buying world just for a bit, perhaps they’ll feel a little of that joy I did in 1982, when the backpack universe was a smaller and more certain place.